It's long been rumoured that a Top Run II is on the cards - well now it is! PHOENIX Virtual Running is inviting you to join us for another Top Run Virtual event with either a 5km or 10km option and the bling is even more epic! So grab your wingman and hop into you F150 Tomcat. Choose either the 5km or 10km option when you sign up. You'll receive a confirmation email with a personalised virtual race number/BIB. Then simply lace up your running shoes and head out to complete your chosen distance. You choose when and you choose where. Run by yourself, with friends or even at an organised event - any run of the right distance counts. Once you've completed your run just submit the evidence to our email address - phoenixvirtualrunningUK@gmail.com in the form of a picture of your Garmin or a screen print of your download. 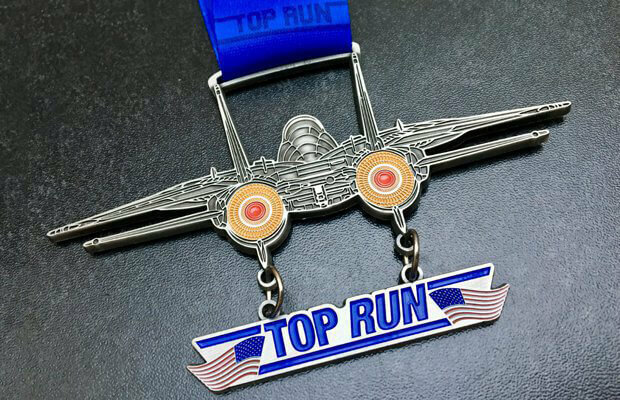 And your finishers' medal will be winging its way to you. Note: We dispatch our medals twice monthly on the 15th and at month end. The medal for this event is one of our finest ever, even if we do say so ourselves. It's 130mm wide with a two-part hanging banner.